JNN 15 Aug 2014 Baghdad : Iraqi President Fuad Masum charged the new Prime Minister-designate Haider al-Abadi with forming a new government, according to Al Arabiya News Channel, before entrenched Prime Minister Nouri al-Maliki’s allies claimed that Abadi had no legitimacy. “The country is now in your hands,” Masum told Abadi on his nomination. Abadi, a member of Maliki’s Dawa party who is viewed as close to the two-term premier, was communications minister in the interim government following the overthrow of Saddam Hussein, after spending much of the dictator’s rule in exile. The decision came shortly after Abadi was nominated by Iraqi National Alliance as prime minister. When Masum accepted the National Alliance Shiite bloc’s nomination of Abadi later Monday, Maliki supporters had gathered on a central square in Baghdad to protest, AFP reported. Meanwhile, Maliki’s State of Law bloc insisted only he could be premier. Reading a statement on state television, Khalaf Abdul-Samad, a member of Maliki’s Dawa Party, said new prime minister Haider al-Abadi “only represents himself,” as a grim-faced Maliki stood beside him. Iraq’s Prime Minister-designate Haider al-Abadi is an eminent Quran scholar. Abadi, who replaced former premier Nouri al-Maleki, has authored a number of books and articles in Islamic and Quranic fields. He taught Quranic sciences and interpretation at the University of Islamic Sciences in London from 1999 to 2003. Born in 1952 in Baghdad, Abadi was educated at the University of Baghdad and later received a doctorate from the University of Manchester in Britain. He lived in Britain for many years after his family was targeted by Saddam Hussein’s Baathist regime. Al-Abadi is a long-time politician and spokesman for Iraq’s Islamic Dawa Party. On Monday, Iraq’s new President Fouad Massoum appointed the deputy parliament speaker Abadi to form the new government. In a televised address, Massoum gave Abadi 30 days to form the next government and present it to parliament for approval. 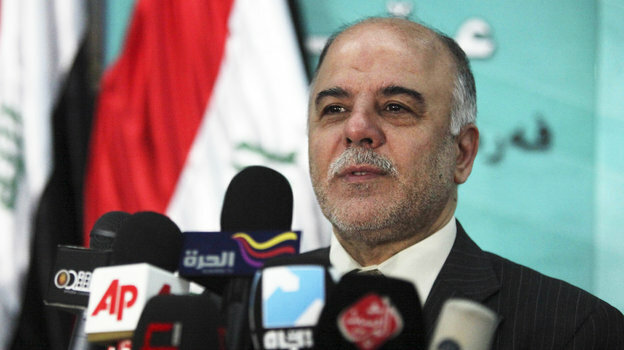 Abadi was nominated for the post by the Iraqi National Alliance, a coalition of Shia parties. The Iranian Foreign Ministry issued a statement on Tuesday expressing support for new Iraqi Prime Minister-designate Haidar al-Abadi. On Monday, Iraqi President Fouad Masoum asked al-Abadi, a Shia coalition’s nominee for the post of prime minister, to form a new government. Iraq’s National Alliance parliamentary bloc nominated al-Abadi for the post of prime minister to replace Nouri al-Maliki. The Iranian Foreign Ministry expresses support for the steps taken in Iraq to complete the “political procedure” in the country, the statement said. Iran insists on “selection of prime minister and the formation of the new Iraqi government” based on the country’s constitution and electoral law, the guidelines of the religious authority and national coalition, it said. Therefore, based on this principle Iran backs an immediate selection of cabinet members by the prime minister and the process of voting for cabinet nominees by the Iraqi parliament, the statement read. It added Iran will continue its support for the Iraqi people and government in countering terrorism and helping boost security and stability in the country. Shortly after his appointment, as the situation of succession from Maliki appeared unclear, the United Nations urged the Iraqi army to stay out of the political process in Baghdad. However, a member of Maliki’s political bloc said “we will not stay silent” over Abadi’s nomination. The move is likely to deepen political tensions at a time when the country needs a united front against a raging Wahabi Terrorism . In a message on Monday, Abadi said all Iraqis must cooperate against “barbaric” campaign by ISIS Terrorists. “We all have to cooperate to stand against this terrorist campaign launched on Iraq and to stop all terrorist groups,” he said in remarks broadcast on state television just after the president asked him to form a government. U.N. Secretary-General Ban Ki-moon on Monday welcomed what he described as “the forward movement toward government formation in Iraq” and praised the Iraqi president’s decision to ask Abadi to form a new cabinet, the United Nations said. Shortly after Abadi’s nomination, a senior U.S. diplomat with responsibility for Iraq on Monday congratulated the new PM-designate on being tasked by President Fuad Masum to form a new government as prime minister. In a short televised statement on Monday, U.S. President Barack Obama praised the nomination of Abadi, adding that he had had urged the Iraqi official in a phone call to swiftly form an inclusive government. Obama added that the new Iraqi leadership had an “important task” in regaining the Iraqi people’s trust. French President Francois Hollande on Monday called on Abadi to quickly form a government of national unity. The decision to appoint Abadi came hours after U.S. Secretary of State John Kerry warned Iraqi Maliki not to cause trouble as Washington threw its weight behind Masum. “We stand absolutely squarely behind President Masum (who) has the responsibility for upholding the constitution of Iraq,” he said in Sydney. “Our hope is that Mr. Maliki will not stir those waters,” Kerry said. Kerry also said that the formation of an Iraqi government was critical for stability. “The government formation process is critical in terms of sustaining stability and calm in Iraq, and our hope is that Mr Maliki will not stir those waters,” Kerry told reporters in Sydney ahead of an annual Australia-United States Ministerial Consultations (AUSMIN). Kerry’s comments followed the U.S. announcement that it was supporting Iraqi President Fuad Masum after Maliki announced on state television he would be filing a complaint against Masum, Agence France Presse reported. “The United States fully supports President Fuad Masum in his role as guarantor of the Iraqi Constitution,” Marie Harf, the State Department spokeswoman, said in a statement, echoing an earlier comment made on Twitter by Deputy Assistant Secretary of State for Near Eastern Affairs Brett McGurk. “We reaffirm our support for a process to select a prime minister who can represent the aspirations of the Iraqi people by building a national consensus and governing in an inclusive manner,” Harf said. On Sunday, Maliki, who has been under pressure to give up his bid for a third term, announced his intentions to file a complaint in a surprise address at midnight (2100 GMT Sunday). He alleged newly elected Masum had violated the constitution twice, including by failing to task a prime minister-designate with forming a new government. Under a de facto agreement among communities in Iraq, the prime minister is a Shia Arab, the president a Kurd, and the parliament speaker a Sunni Arab. Iraqi Prime Minister Nouri al-Maliki said on Wednesday it will take a court ruling for him to leave power, defying the president’s decision to task a rival with forming a government. “I confirm that the government will continue and there will not be a replacement for it without a decision from the federal court,” Maliki said in his televised weekly address, according to AFP. The two-term premier has accused President Fouad Masum of violating the constitution by approving the nomination of Haider al-Abadi, a member of his Dawa party, to form a government, and vowed he would sue. Maliki has complained to the Federal Court that, as leader of the largest bloc in the new parliament, he must by right be given the first chance to form a new government. The appointment by Masoum of Abadi as prime minister-designate on Monday was therefore a breach of the constitution, he said, Reuters reported. In theory, Maliki should continue as acting premier, with limited powers, until a new government is sworn in. He has had the personal loyalty of senior commanders of the police and armed forces as well as irregular Shi’ite militia units. It is unclear he would try to resist his removal by force, however. On Tuesday, he urged commanders to keep out of politics. Whatever ruling the court might deliver, analysts say Maliki has lost too much support to stay in power. And international backing has meanwhile poured in for Abadi, including from both Washington and Tehran, the two main foreign power-brokers in Iraq. This entry was posted in Iraq News, Middle East and tagged Haider Al Abadi, Iraq's New PM, Iraqi Maliki, Iraqi President, Iraqi President Fuad Masum, Maliki, Nouri al-Maliki, Prime Minister, sectarian conflict, Shia PM. Bookmark the permalink.